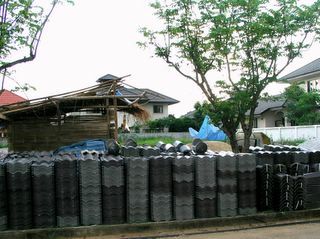 A house is about to be built here and, in typical Thai fashion, they arrange delivery of the most important bits first. Seems somehow logical that, as this is the rainy season, they want to keep dry. Therefore better get the tiles first! No bricks, concrete or even tools. Just the tiles. I'll try to get a photo if they get the roof up without support.